Having just begun his studies in Sport Health and Physical Education, 18 year old Darryl Gallagher competed at the Kick Boxing World Championships in Taranto, Italy. Not only did he sucessfully defended his Continuous category Title in the 16-18 minus 70kg weight category, he also won the Points category. Darryl, of Maes Tryfan, Upper Bangor, has been kickboxing since he was 6 and training seriously, travelling regularly to Liverpool Kickboxing Clun Mushin Kai since the age of 11. He is currently World Champion, and has won the Continuous or Points category or both categories since 2009. Having progressed to Bangor University from Coleg Menai, Darryl has been awarded a Bangor University Sports Scholarship to support him in following his competitive sport at an elite level. 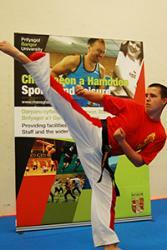 Darryl has also received a Maes Glas Bursary from the University’s Sports Centre for the past two years. This Bursary is awarded to promising local athletes, and has enabled him to have free access to the sports facilities on his door-step and also free coaching from the Centre’s Health & Fitness Manager, Dave Jones. Darryl continues to receive support and coaching for his weight training from Dave Jones at Maes Glas and travels to Liverpool three times a week for training in Kickboxing technique. Darryl has three black belts in Freestyle, Shotokan Karate and Lau Gar and competes in a number of competitions, though the World Championships are the pinnacle of the year’s competitions for him. “I move into the men’s category next year and my long-term goal is to win in that section and to then compete against all other category winners to achieve Grand Champion status,” he said. “I’ve received great support from Maes Glas, and in the short time I’ve been at University, my tutors have been very understanding with my training,” he said. Darryl hopes to learn more about that aspect as he progresses through his degree. “I would also like to run my own kickboxing club after graduating from University,” he said. Darryl chose to study at the School of Sort Health & Exercise Science at his local university as the School is amongst the very best sport related subject departments in Britain and is also internationally renowned for the quality of its research and has some of the world’s leading researchers.